The ‘Sleepy Hollow’ script is written by Andrew Kevin Walker, who also wrote the script to David Fincher’s ‘Se7en’ (1995). Like ‘Se7en’, ‘Sleepy Hollow’ has dark themes, fast-paced scenes and intelligent twists. However, the script to ‘Sleepy Hollow’ differs greatly from Washington Irving’s story. The film seems only to borrow some general outline and concepts from the story. Irving’s story, although rich in detail, is straightforward, with uncomplicated characters and unexciting, sad finale. However, the movie contains twists and turns, delving deep into each character, revealing their complexities. For example, in Irving’s original story, Ichabod is presented as a somewhat unattractive, self-interested and simple, but good-hearted, village school-teacher who shyly manages to capture the attention of a beautiful coquette, Katrina Van Tassel. In the movie, Ichabod has a very different, more complex personality. He believes in the scientific progress and methodology, and is not easily swayed by the beauties of the village. While the film can be criticised for not following the original story, it may be a good thing that it does not, and this is because the short story is somewhat reminiscent of Goethe’s ‘The Sorrows of Young Werther’, and this would have made for a very dull and depressing movie. The film also tells the story of the Headless Horseman at the very beginning, robbing the audience of large portions of tension and intrigue, although it does have a fair amount of twists towards the end to make up for this loss. Since its Burton, the director of ‘Beetlejuice’ (1988), some scenes (especially those with the Headless Horseman) are also totally ridiculous and very funny to watch. This may be slightly unfortunate if one expects a serious horror thriller, but such scenes do intend to discharge the tension, while again showing off Burton’s talent for mixing inventive fantasies with dark, Gothic designs. The film could also have had more structure to it, instead of jumping back and forth in time now and then, as well as make an effort to be more believable. However, nevertheless, what the production manages to achieve with brilliance is to create this creepy and eerie atmosphere to the movie: from the dialogue and the costumes to the dreary lightning and the music, ‘Sleepy Hollow’ is a very Gothic spin on an already familiar story. By way of trivia, the production constructed the set of ‘Sleepy Hollow’ in a record-time, i.e., three months, and the film was actually awarded an Academy Award in the category of the Best Art Direction-Set Decoration. Incidentally, it was also previously a Disney animation film ‘The Adventures of Ichabod and Mr Toad’ (1949). In fact, ‘Sleepy Hollow’ pays some homage to this old Disney cartoon by including some of the scenes from the cartoon, such as the scene whereby Ichabod passes the bridge and hears his own name being said. The music of the film, composed by Danny Elfman, is also hauntingly beautiful, and it remains a mystery how it managed to bypass an Academy Award nomination. Some commentators have remarked that the only good thing about ‘Sleepy Hollow‘ is its cliché art direction, including special effects and action sequences, but it is unfair to say so. The film has a great veteran acting ensemble which delivers solid, believable performances. Johnny Depp is in his favourite eccentric role, and, therefore, is very comfortable on the set, portraying his character convincingly. Actually, Depp also plays a similar role of a police constable in Hughes brothers’ adaptation of Alan Moore’s comic ‘From Hell’ (2001) about Jack the Ripper’s murders in England. Miranda Richardson (‘Spider’ (2002), ‘Harry Potter and the Goblet of Fire’ (2005)) and Michael Gambon (‘Harry Potter’ films) are also very good as Van Tassels. Burton even managed to persuade Michael Gough (best known for playing Butler Alfred Pennyworth in Burton’s Batman films) to come back from his retirement and to be cast as creepy Notary Hardenbrook. I always claim that Halloween is the single movie that scared me. Yet I sometimes forget that I used to go to bed at night believing that the Headless Horseman was on his way to get me! Great review and an underrated film in my view! Thanks! ‘Halloween’ is very scary. It still gives me chills. ‘Sleepy Hollow’ is different from other horror films. I think it is similar to ‘From Hell’ (2001); I am surprised that it didn’t get a higher score on rotten tomatoes. Good read! 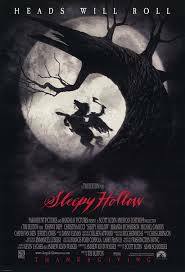 I haven’t seen Sleepy Hollow in a long while but I do remember seeing it on the big screen when it was first released. Although Burton’s film all have a great visual style I’ve always thought Sleepy Hollow was one of his most beautiful-to-look-at films.